Total direct and indirect clientele summed to over 5,950 people. We responded to over 1,560 telephone calls and walk-ins. We presented 15 workshops to 1,200 attendees, almost half of whom were Mexican citizens renewing documents through SB’s ongoing relationship with the Mexican Consulate. 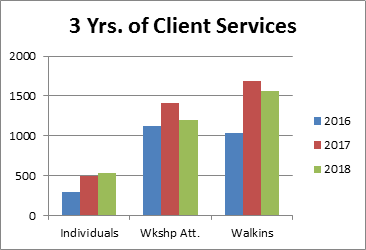 We offered one-on-one services to 538 clients, 10% more than last year. We assisted 388 clients in legal and immigration affairs, up 20% from last year. With the continued pro bono services from two immigration lawyer colleagues and our two “accredited representatives,” we provided immigration consultations including DACA to 289 clients, a 75% increase from 2017. 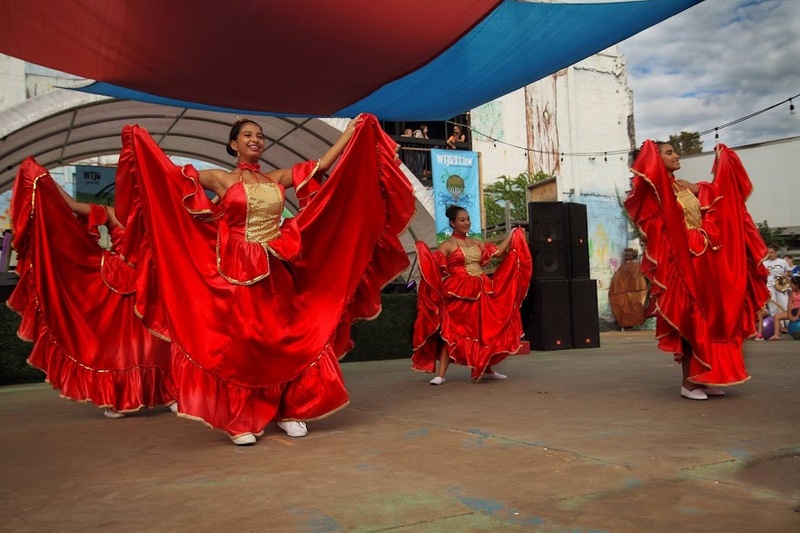 As in previous years, we co-hosted Cville Sabroso, Charlottesville’s only Latin American music and dance festival, financed this year in part by the City of Charlottesville, with over 2,400 attendees. We dramatically expanded Advocacy efforts on many different fronts. We continued to benefit from enormously strong volunteer time: 8,000 hours, representing an in-kind equivalent of over $200,000. We also won several grants to help pay our part-time employees: from the Bama Works Foundation, the Charlottesville Area Community Foundation, the City of Charlottesville, and various community groups; and our financial position is the strongest it has ever been: 31/2 times our assets last year. The first pillar of Sin Barreras’ Mission is providing group services and workshops focused on Hispanic immigrant community needs. We hosted fifteen such events this year for over 1,200 attendees, (a small decline from 2017 numbers.) Two of these were facilitated for the Mexican Consulate – offering 550 people the opportunity to process their Mexican government docu-ments without an all-day trip to Washington, D.C. Others included a legal clinic, English as a second language classes, a mental health clinic, mammogram visits, a labor rights workshop, and more. Sixty people attended the “Festival de Salud y Bienestar” (Health and Well-Being workshop) sponsored by SB, the Latina Health Initiative, and Common Grounds, which offered cardiovascular and diabetes screening, massage, acupuncture, yoga, and stress reduction sessions. As in 2017, we also participated in events hosted by partner entities: a Hispanic Community Day in Lovingston, the Southwood “Back to School Fair,” several interfaith services, three Creciendo Juntos events (a colleague NGO), and others, providing Sin Barreras information to several hundred people whom we would otherwise not reach. Our second pillar of activities is one-on-one services, responding to nearly 1,560 telephone calls in 2018. Of that total, we conducted 538 individual appointments, up from 494 consultations in 2017. For 99 clients requesting general legal consultations, we provided assistance in many “big” topics: detention, bond hearings, job discrimination, divorce and custody cases, court appearances, driving offenses, and others. But we also brought about other quality-of-life improvements. One was assisting a minor whose parents had just been deported and who was moved into Foster Care, but the Foster Care mother couldn’t afford the airplane ticket to get her back home—which we provided. Another was a desperate mother who needed to support her incarcerated son in California but couldn’t afford the airfare. A third was emergency legal representation in court for three clients so as not to inadvertently bring about their own deportation. Another was helping two recently arrived, hardworking and needy adolescents get into school. Our call log is filled with hundreds of such “small” accomplishments. Immigration: Meanwhile, immigration is the most important issue facing most of the area’s immigrant community. Two years ago Sin Barreras received USG recognition to offer immigration services by means of two Department of Justice-approved non-lawyer volunteers called Accredited Representatives. Benefitting from the contribution of two local immigration lawyers, in 2018 Sin Barreras had four pro bono volunteers providing immigration services. This year, we offered 289 immigration consultations, a 75% increase from last year. See Section III for examples. Language Training: A service begun last year was one-on-one language training for fifteen or so Latinos who want to integrate better into U.S. society. Topics included tutoring kids with homework assignments, general English fluency, and others. 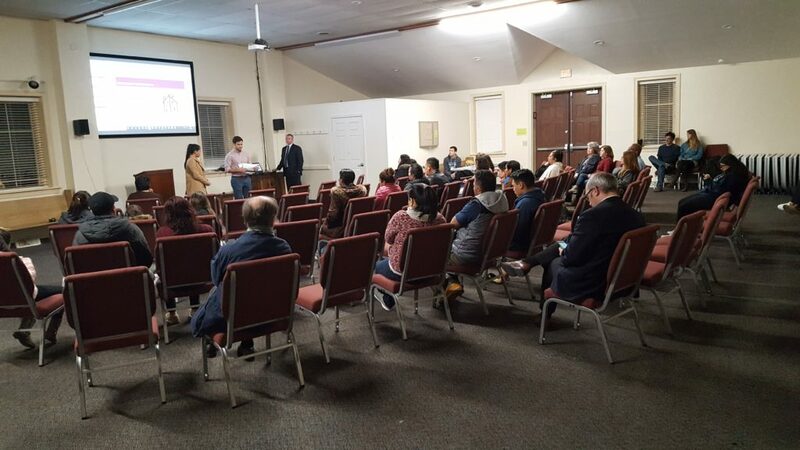 UVA student volunteers from Madison House, the Latinix Group, and Migrant Aid carried out this training, a well-received initiative that continues in 2019. Legal Assistance Fund: Thanks to several 2017 donors, Sin Barreras has created a special set-aside fund to help immigrants when they would have a hard time paying USG document fees or have other pressing financial needs. One was a young Honduran hairdresser who couldn’t afford her $700 appeal costs; another was a single Honduran mother who brought her six children across the border and was unable to feed them while she found her feet in Charlottesville. We assisted seven young people with their DACA fees this way, and we paid an indigent Guatemalan’s lawyer’s fees for the lawyer to assume her complicated asylum petition. Use of this fund has been a wonderful addition to our services. Power of Attorney: As in past years, another Sin Barreras service was helping undocumented clients create a Power-of-Attorney to establish a legally enforceable care plan for their children in case of summary deportation, a horrible possibility for many these days. We had a dozen or more of such clients this year. Naturalization Exam Coaching: Another service we provide is one-on-one coaching to prepare for the Naturalization exam, which requires knowledge of 100 civics questions, ability to write a dictated sentence, and some modicum of conversational English. Because of limited English, and/or limited education in one’s home country, and/or difficulties understanding U.S. history, this coaching frequently takes months of effort– visits with the coach every two weeks as the client painstakingly memorizes civics questions and learns how to write a properly punctuated English sentence. We have helped at least a dozen such clients pass their exam this way in 2018, with citizenship being the inestimably valued prize. 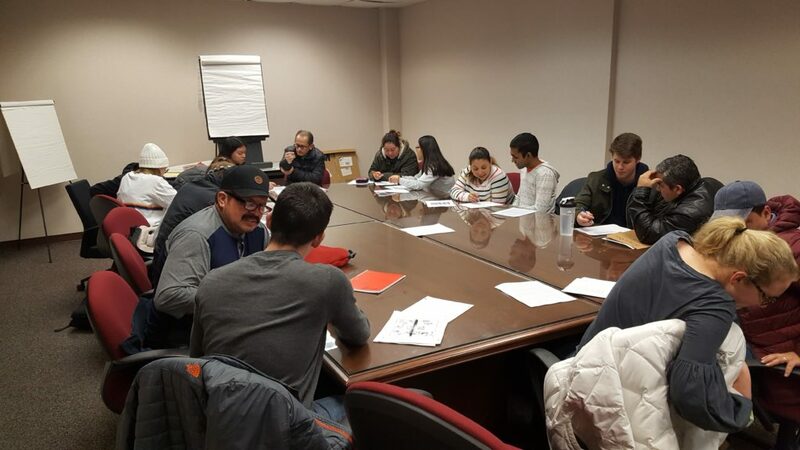 Leadership Development: In conjunction with the Sacred Heart Immigrant Center in Richmond, we co-host a two-semester, 80-hour study program in Civics and Leadership Development for fifteen Hispanics. Created by the Sacred Heart Center – now in its fifth year offering it in Richmond (though the first in Charlottesville) — the course awards a Certificate of Accomplishment from the University of Richmond on successful completion of studies. It has a high emphasis on civic activism, as well as reinforcing how important the sense of community is in the Hispanic immigrant society. Asylum Support: Late in the year, we supported the effort of a local church that began providing asylum to a Guatemalan refugee under the threat of deportation. With the church taking the preeminent role, Sin Barreras has been providing behind-the-scenes emotional, financial, and social support to this woman as she remains confined to the church sanctuary. Our involvement in Advocacy, our third organizational pillar, has taken on a much greater urgency than in past years, and our activities were varied and important. The Albemarle County Regional Jail: Sin Barreras has been an active member of a community effort to lobby the Albemarle County Regional Jail to change its policy of informing Immigration and Customs Enforcement (ICE) 48 hours in advance of Hispanics finishing their jail sentences. Over two-dozen such incidents took place in 2018, resulting in Hispanics being taken into ICE custody – and likely deported – for as small an offense as driving with a broken taillight or running a stop sign for the third time. SB was pleased to participate with other community groups in three different presentations to the ACRJ Board lobbying for this change, and we continue to do so. The Virginia Legislature: The Virginia legislature convenes in January each year. 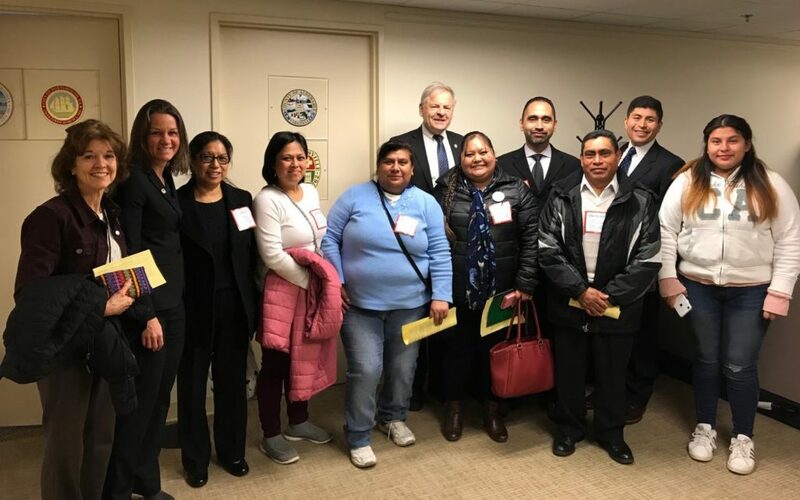 As in the last five years, Sin Barreras organized a “Visit-Your-Legislator Day,” and 16 Hispanic Charlottesville residents accompanied SB Board members in presenting priorities that impact Hispanic immigrants to our lawmakers. Meetings with Local Political Leaders: Early in the year we hosted a meeting with Charlottesville’s newly elected Mayor and Deputy Mayor. A month later, Sin Barreras participated with 35 Latino organizations in a meeting with Governor Northam. An Advocacy sub-committee composed of half a dozen civic activists has been organized within SB to address Advocacy more holistically, resulting in a meeting held with our Virginia State Senator, the Honorable Creigh Deeds, in a rich hour-long discussion on Hispanic community needs. We also hosted a meeting with one of the candidates running for the House of Delegates. City and County outreach: We co-hosted several get-to-know-you events between the community and the Albemarle County Police Department, one in July, another in December; and several Board members accompanied an ACPD official who walked with the community in a three-hour, pre-dawn pilgrimage through the city celebrating of Our Lady of Guadalupe Day. We also had a meeting with Police Chief of the ACPD and recently with the Charlottesville Chief to present the Hispanic perspective on numerous issues. 24 hour Hot line: For some months in 2017 and then 2018 we finalized the creation with other active citizens of a 24-hr hot line to observe and report on ICE abuses if ICE raids take place. Fortunately, the hot-line has not been used so far, but the response mechanism exists and the Sin Barreras telephone number is manned by volunteers 24-hr.a day. Public Information: From time to time, we are asked to present Hispanic issues to various groups—not so much Advocacy as “provision of community information.” One such event was to seventy-five members of the Blue Ridge Rotary Club; another was to two Democratic Women’s Associations, of Fluvanna and Madison; another presentation was to Merck Pharmaceuticals at its Waynesboro plant. We believe this is an important Sin Barreras role: to expose the wider (Anglo) community to Hispanic immigrant realities. Symposium: In a related event, Sin Barreras hosted Charlottesville’s first-ever Symposium on the Hispanic experience. Availing of donated space at the YMCA, an all-day event took place with twelve different presentations on the Hispanic condition: two by university history professors on U.S. involvement in the Americas and immigration law; two by university professors on the economic and health situation of the Hispanic community; two by local lawyers on current immigration law and ICE enforcement practices; and three community voices describing their personal immigration experiences. Forty people attended the event and each of the presentations was filmed and is being made available for wider dissemination in 2019. Political Activism: Other Sin Barreras political activism has increased dramatically in 2018. We made a presentation at a Community Workshop at the University of Virginia, also participating in several protests at the Staunton Juvenile Detention Center and the Farmville Regional Detention Center, and against the Culpeper Police’s assuming ICE enforcement functions. We also carried out a presentation on public access T.V. interview, an Immigration panel, several Sanctuary events, and the Virginia Coalition of Latino Organization’s (VACALAO) Fifth Annual conference – this year as one of its co-hosts. Cville Sabroso, central Virginia’s only Latin American music and dance festival, was another great success this year, with 2,400 attendees. It was a beautiful day for music and fun: for Latinos and non-Latinos, families with young children, and people of all ages. Different from previous years because of a shift to a Sunday program, many more Latino families participated this year than in previous years—to our delight. Different nationalities performed their countries’ music and dance dressed in colorful national costumes. Abundant ethnic food came from Hispanic-owned food providers. Meanwhile, UVA and other volunteers sat under a large tent and offered crafts and kids’ face-painting. Cville Sabroso is designed to show the richness of Hispanic society to the wider community. It has also become an integral part of Charlottesville’s cultural calendar and for the first time ever, was partially financed with official City funds. It is one of Sin Barrera’s premier yearly events. Sin Barreras received generous support from numerous grantors in 2018. One was from the Bama Works Foundation to defray part-time salary costs; another from the City of Charlottesville supported Cville Sabroso and general administration costs. 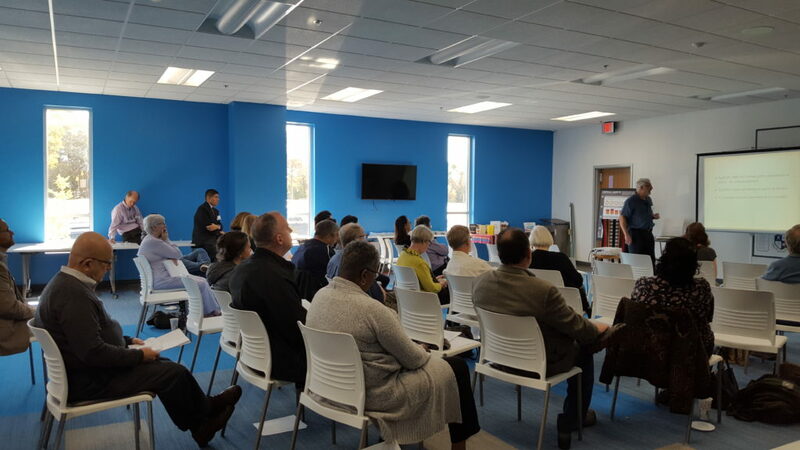 We also received two grants from one of our most steadfast donors, the Charlottesville Area Community Foundation (CACF), for two innovative projects, the Symposium discussed above, and a Racial Equity project. We also benefitted from various local groups’ generosity: an Art fundraising event, a documentary screening, a Westminster Presbyterian Church donation, and a Soup fundraiser. While we still operate on a shoe- string, institutional and private support has come forward this year to help us to maintain three part-time salaried staff (who organize, coordinate and supervise the wide range of our volunteer activities.) Late in 2018 we won an additional grant from CACF to allow us in 2019 to hire our first-ever full-time employee, a giant step forward in organizational maturation. We are enormously appreciative of these votes of confidence. Volunteers are the backbone of our organization, and as in previous years, total volunteer hours have been gratifying. Total hours were 8,006, an increase of almost 20% from 2017, which itself was a 65% increase from 2016. Average volunteer hours this year were 670 per month! Several highly active volunteers offered 95 or more hours a month; additionally we have two dozen ad-hoc volunteers, many of them UVA students who contribute during certain (non-exam) periods. Total hours were split: 63% for Board and core volunteers, 21% hours for UVA (and other) volunteers, and 16% for one-off events such as Cville Sabroso, workshops, and others. Using the established Virginia in-kind valuation of $24.90 per hour to quantify this impact, the monetized value of this time was over $200,000. Sin Barreras can offer its services only because of such people: each brings special skills to respond to our community’s many needs. At the start of 2018, Sin Barreras had $34,930 in accumulated assets. The year’s expenditures were $73,850. Our growth of assets (some of it restricted) has been phenomenal, over 3 times, a huge accomplishment for such a small organization. Another of the activities we feel tremendously proud of is several adolescents whom we have been instrumental in acquiring LPR status for under the Special Immigrant Juvenile Status (SIJS) act. This law allows children who crossed the border without an accompanying parent to petition for special protection and is a tortuous process because the child must first have his/her case tried successfully in the Virginia Juvenile Court, and only when the Virginia Court decides, to apply for Federal protection. Our involvement was not only identifying the SIJS possibility for these children, but then also helping shepherd them through the entire process. They are now Green Card holders and in five years can become citizens. Sin Barreras has had gratifying success in 2018: increasing nearly all of our directly-served clients in response to the darkening anti-immigrant environment, while indirectly reaching thousands of others to help them appreciate the Hispanic immigrants’ contribution to the US way of life. With the help of important donors, we are now able to remunerate three part-time and, soon, one full-time staff as we become an even more articulate voice of Hispanic issues in Charlottesville and central Virginia. We are enormously grateful to our donors and to the volunteers who make our work possible. As we brace for another difficult year in 2019, we commit to even further dedication to our cause, and a better life for all Charlottesville-area immigrants. Introduction Sin Barreras is a small local NGO offering services to the immigrant, mostly Hispanic community. Founded in 2012 by five Charlottesville residents concerned that immigrants were not availing of social services because of language obstacles, and there was no organization adequately addressing other Hispanic immigrant issues, it was awarded its 501(c)(3) status in July, 2014. After three years run completely by volunteers, in 2016 it won a grant to begin paying its first part-time office person, now in 2019 up to three part-time staff. It consists of a five-member Board, two long-term volunteers, and two-dozen short-term volunteers. This is its fourth Annual Report. I. Executive Summary Sin Barreras’ second Three-Year Strategic Plan focuses on: 1) improved service provision via workshops on topics of Hispanic community interest and one-on-one client services; 2) improved functioning (and funding); and 3) strengthened Advocacy with like-minded organizations. Responding to the increasingly anti-immigrant national rhetoric, Sin Barreras provided direct services to 3,500 people and indirect services to another 2,400 this year. Summarizing: •	Total direct and indirect clientele summed to over 5,950 people. •	We responded to over 1,560 telephone calls and walk-ins, (down 8% from 2017.) •	We presented 15 workshops to 1,200 attendees. Almost half of these were Mexican citizens renew-ing documents through SB’s ongoing relationship with the Mexican Consulate. •	We offered one-on-one services to 538 clients in 2018, 10% more than the previous year. •	We assisted a total of 388 clients in legal affairs and immigration, up 20% from last year. Of that total, with the continued pro bono services from two immigration lawyer colleagues and our two “accredited representatives,” we provided immigration consultations including DACA to 289 clients, a 75% increase from 2017. •	As in previous years we co-hosted Cville Sabroso, Charlottesville’s only Latin American music and dance festival, financed this year in part by the City of Charlottesville, with over 2,400 attendees (not shown in this chart.) •	We have dramatically expanded our Advocacy efforts this year on many different fronts. •	We have benefitted from enormously strong volunteer time: over 8,000 hours in 2018, representing an in-kind value equivalent of over $200,000. •	This year we won a number of important grants to help pay our part-time employees: from the Bama Works Foundation, the Charlottesville Area Community Foundation, the City of Charlottesville, plus various community groups. •	Our financial position is the strongest it has ever been: 31/2 times our assets last year, $122,520 at year’s end. II. Accomplishment Detail A.	Workshops and Other Community Events The first pillar of Sin Barreras’ Mission is providing group services and workshops focused on Hispanic immigrant community needs. We hosted fifteen such events this year for over 1,200 attendees, (a small decline from 2017 numbers.) Two of these were facilitated for the Mexican Consulate – offering 550 people the opportunity to process their Mexican government docu-ments without an all-day trip to Washington, D.C. Others included a legal clinic, English as a second language classes, a mental health clinic, mammogram visits, a labor rights workshop, and more. Sixty people attended the “Festival de Salud y Bienestar” (Health and Well-Being workshop) sponsored by SB, the Latina Health Initiative, and Common Grounds, which offered cardiovascular and diabetes screening, massage, acupuncture, yoga, and stress reduction sessions. As in 2017, we also participated in events hosted by partner entities: a Hispanic Community Day in Lovingston, the Southwood “Back to School Fair,” several interfaith services, three Creciendo Juntos events (a colleague NGO), and others, providing Sin Barreras information to several hundred people whom we would otherwise not reach. B. One-on-One Services Our second pillar of activities is one-on-one services, responding to nearly 1,560 telephone calls in 2018. Of that total, we conducted 538 individual appointments, up from 494 consultations in 2017. For 99 clients requesting general legal consultations, we provided assistance in many “big” topics: detention, bond hearings, job discrimination, divorce and custody cases, court appearances, driving offenses, and others. But we also brought about other quality-of-life improvements. One was assisting a minor whose parents had just been deported and who was moved into Foster Care, but the Foster Care mother couldn’t afford the airplane ticket to get her back home—which we provided. Another was a desperate mother who needed to support her incarcerated son in California but couldn’t afford the airfare. A third was emergency legal representation in court for three clients so as not to inadvertently bring about their own deportation. Another was helping two recently arrived, hardworking and needy adolescents get into school. Our call log is filled with hundreds of such “small” accomplishments. Immigration: Meanwhile, immigration is the most important issue facing most of the area’s immigrant community. Two years ago Sin Barreras received USG recognition to offer immigration services by means of two Department of Justice-approved non-lawyer volunteers called Accredited Representatives. Benefitting from the contribution of two local immigration lawyers, in 2018 Sin Barreras had four pro bono volunteers providing immigration services. This year, we offered 289 immigration consultations, a 75% increase from last year. See Section III for examples. Language Training: A service begun last year was one-on-one language training for fifteen or so Latinos who want to integrate better into U.S. society. Topics included tutoring kids with homework assignments, general English fluency, and others. 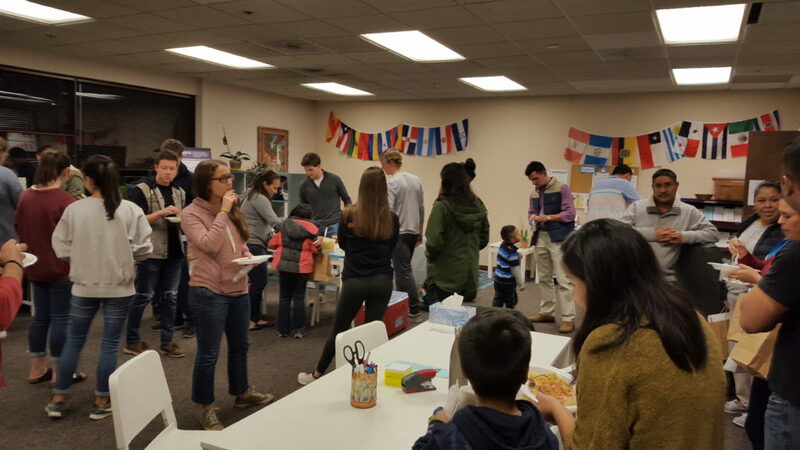 UVA student volunteers from Madison House, the Latinix Group, and Migrant Aid carried out this training, a well-received initiative that continues in 2019. Legal Assistance Fund: Thanks to several 2017 donors, Sin Barreras has created a special set-aside fund to help immigrants when they would have a hard time paying USG document fees or have other pressing financial needs. One was a young Honduran hairdresser who couldn’t afford her $700 appeal costs; another was a single Honduran mother who brought her six children across the border and was unable to feed them while she found her feet in Charlottesville. We assisted seven young people with their DACA fees this way, and we paid an indigent Guatemalan’s lawyer’s fees for the lawyer to assume her complicated asylum petition. Use of this fund has been a wonderful addition to our services. Power of Attorney: As in past years, another Sin Barreras service was helping undocumented clients create a Power-of-Attorney to establish a legally enforceable care plan for their children in case of summary deportation, a horrible possibility for many these days. We had a dozen or more of such clients this year. Naturalization Exam Coaching: Another service we provide is one-on-one coaching to prepare for the Naturalization exam, which requires knowledge of 100 civics questions, ability to write a dictated sentence, and some modicum of conversational English. Because of limited English, and/or limited education in one’s home country, and/or difficulties understanding U.S. history, this coaching frequently takes months of effort-- visits with the coach every two weeks as the client painstakingly memorizes civics questions and learns how to write a properly punctuated English sentence. We have helped at least a dozen such clients pass their exam this way in 2018, with citizenship being the inestimably valued prize. Immigrant Voices: In a Charlottesville version of NPR’s Story Corp Project, Sin Barreras and WTJU collaborated in identifying thirty people willing to share poignant moments of their immigrant experience. Though only a few seconds long, these life stories are tremendously evocative and help explain some part of what it means to live in someone else’s country. (https://www.dropbox.com/sh/pmhzei9lxr6knx0/AABWtOXp2CnsWRvNjIZvISzOa?dl=0.) Leadership Development: In conjunction with the Sacred Heart Immigrant Center in Richmond, we co-host a two-semester, 80-hour study program in Civics and Leadership Development for fifteen Hispanics. Created by the Sacred Heart Center – now in its fifth year offering it in Richmond (though the first in Charlottesville) -- the course awards a Certificate of Accomplishment from the University of Richmond on successful completion of studies. It has a high emphasis on civic activism, as well as reinforcing how important the sense of community is in the Hispanic immigrant society. Asylum Support: Late in the year, we supported the effort of a local church that began providing asylum to a Guatemalan refugee under the threat of deportation. With the church taking the preeminent role, Sin Barreras has been providing behind-the-scenes emotional, financial, and social support to this woman as she remains confined to the church sanctuary. C.	Advocacy Our involvement in Advocacy, our third organizational pillar, has taken on a much greater urgency than in past years, and our activities were varied and important. The Albemarle County Regional Jail: Sin Barreras has been an active member of a community effort to lobby the Albemarle County Regional Jail to change its policy of informing Immigration and Customs Enforcement (ICE) 48 hours in advance of Hispanics finishing their jail sentences. Over two-dozen such incidents took place in 2018, resulting in Hispanics being taken into ICE custody – and likely deported – for as small an offense as driving with a broken taillight or running a stop sign for the third time. SB was pleased to participate with other community groups in three different presentations to the ACRJ Board lobbying for this change, and we continue to do so. The Virginia Legislature: The Virginia legislature convenes in January each year. 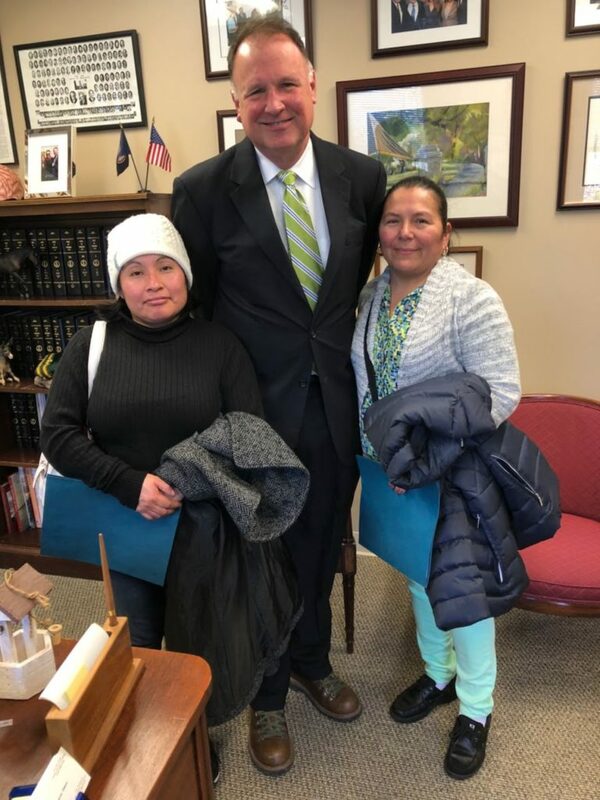 As in the last five years, Sin Barreras organized a “Visit-Your-Legislator Day,” and 16 Hispanic Charlottesville residents accompanied SB Board members in presenting priorities that impact Hispanic immigrants to our lawmakers. Meetings with Local Political Leaders: Early in the year we hosted a meeting with Charlottesville’s newly elected Mayor and Deputy Mayor. A month later, Sin Barreras participated with 35 Latino organizations in a meeting with Governor Northam. An Advocacy sub-committee composed of half a dozen civic activists has been organized within SB to address Advocacy more holistically, resulting in a meeting held with our Virginia State Senator, the Honorable Creigh Deeds, in a rich hour-long discussion on Hispanic community needs. We also hosted a meeting with one of the candidates running for the House of Delegates. City and County outreach: We co-hosted several get-to-know-you events between the community and the Albemarle County Police Department, one in July, another in December; and several Board members accompanied an ACPD official who walked with the community in a three-hour, pre-dawn pilgrimage through the city celebrating of Our Lady of Guadalupe Day. We also had a meeting with Police Chief Lantz of the ACPD and his senior officers to present the Hispanic perspective on numerous issues. A similar meeting is scheduled with the Charlottesville Chief of Police at this writing. 24 hour Hot line: For some months in 2017 and then 2018 we finalized the creation with other active citizens of a 24-hr hot line to observe and report on ICE abuses if ICE raids take place. Fortunately, the hot-line has not been used so far, but the response mechanism exists and the Sin Barreras telephone number is manned by volunteers 24-hr.a day. Public Information: From time to time, we are asked to present Hispanic issues to various groups—not so much Advocacy as “provision of community information.” One such event was to seventy-five members of the Blue Ridge Rotary Club; another was to two Democratic Women’s Associations, of Fluvanna and Madison; another presentation was to Merck Pharmaceuticals at its Waynesboro plant. We believe this is an important Sin Barreras role: to expose the wider (Anglo) community to Hispanic immigrant realities. Symposium: In a related event, Sin Barreras hosted Charlottesville’s first-ever Symposium on the Hispanic experience. Availing of donated space at the YMCA, an all-day event took place with twelve different presentations on the Hispanic condition: two by university history professors on U.S. involvement in the Americas and immigration law; two by university professors on the economic and health situation of the Hispanic community; two by local lawyers on current immigration law and ICE enforcement practices; and three community voices describing their personal immigration experiences. Forty people attended the event and each of the presentations was filmed and is being made available for wider dissemination in 2019. Political Activism: Other Sin Barreras political activism has increased dramatically in 2018. We made a presentation at a Community Workshop at the University of Virginia, also participating in several protests at the Staunton Juvenile Detention Center and the Farmville Regional Detention Center, and against the Culpeper Police’s assuming ICE enforcement functions. We also carried out a presentation on public access T.V. interview, an Immigration panel, several Sanctuary events, and the Virginia Coalition of Latino Organization’s (VACALAO) Fifth Annual conference – this year as one of its co-hosts. D.	Cville Sabroso Cville Sabroso, central Virginia’s only Latin American music and dance festival, was another great success this year, with 2,400 attendees. It was a beautiful day for music and fun: for Latinos and non-Latinos, families with young children, and people of all ages. Different from previous years because of a shift to a Sunday program, many more Latino families participated this year than in previous years—to our delight. Different nationalities performed their countries’ music and dance dressed in colorful national costumes. Abundant ethnic food came from Hispanic-owned food providers. Meanwhile, UVA and other volunteers sat under a large tent and offered crafts and kids’ face-painting. Cville Sabroso is designed to show the richness of Hispanic society to the wider community. It has also become an integral part of Charlottesville’s cultural calendar and for the first time ever, was partially financed with official City funds. It is one of Sin Barrera’s premier yearly events. E.	Grants Sin Barreras received generous support from numerous grantors in 2018. One was from the Bama Works Foundation to defray part-time salary costs; another from the City of Charlottesville supported Cville Sabroso and general administration costs. We also received two grants from one of our most steadfast donors, the Charlottesville Area Community Foundation (CACF), for two innovative projects, the Symposium discussed above, and a Racial Equity project. We also benefitted from various local groups’ generosity: an Art fundraising event, a documentary screening, a Westminster Presbyterian Church donation, and a Soup fundraiser. While we still operate on a shoe- string, institutional and private support has come forward this year to help us to maintain three part-time salaried staff (who organize, coordinate and supervise the wide range of our volunteer activities.) Late in 2018 we won an additional grant from CACF to allow us in 2019 to hire our first-ever full-time employee, a giant step forward in organizational maturation. We are enormously appreciative of these votes of confidence. F.	Volunteering Volunteers are the backbone of our organization, and as in previous years, total volunteer hours have been gratifying. Total hours were 8,006, an increase of almost 20% from 2017, which itself was a 65% increase from 2016. Average volunteer hours this year were 670 per month! Several highly active volunteers offered 95 or more hours a month; additionally we have two dozen ad-hoc volunteers, many of them UVA students who contribute during certain (non-exam) periods. Total hours were split: 63% for Board and core volunteers, 21% hours for UVA (and other) volunteers, and 16% for one-off events such as Cville Sabroso, workshops, and others. Using the established Virginia in-kind valuation of $24.90 per hour to quantify this impact, the monetized value of this time was over $200,000. Sin Barreras can offer its services only because of such people: each brings special skills to respond to our community’s many needs. G.	Finances At the start of 2018, Sin Barreras had $34,930 in accumulated assets. The year’s expenditures were $73,850 while total service income, grants, and donations summed to $161,440. Our growth of assets (some of it restricted) has been phenomenal, 350%! At year’s end we have $122,525 in the bank, a huge accomplishment for such a small organization. III. Human Stories behind Sin Barreras One of our most satisfying successes is achieving favorable immigration outcomes for our clients: this year, a dozen became citizens or Legal Permanent Residents (LPR). One was a Colombian refugee who came knocking on our door the first day of completion of her required 5-yr. LPR status. Her early-twenties daughter followed shortly thereafter (and subsequently is applying for a Green Card for her husband.) Two others were Columbian refugees who needed five months’ study to acquire language and civics skills to pass the citizenship exam. Another was a Salvadoran hotel housekeeper who studied for eight months to pass the language test. Another is a Mexican single mom who owns her own painting company. Yet another is a Honduran mom who, on acquiring her citizenship, has now supported her husband’s petition to adjust status to LPR, at the same time motivating her adult son to apply for his citizenship. These clients’ cases can take twenty hours or more of preparation (several of them, up to fifty hours spread over months) in order to present letter-perfect applications. We have many such stories. Each is an enormously enriching experience for Sin Barreras and one of our most satisfying accomplishments Another of the activities we feel tremendously proud of is several adolescents whom we have been instrumental in acquiring LPR status for under the Special Immigrant Juvenile Status (SIJS) act. This law allows children who crossed the border without an accompanying parent to petition for special protection and is a tortuous process because the child must first have his/her case tried successfully in the Virginia Juvenile Court, and only when the Virginia Court decides, to apply for Federal protection. Our involvement was not only identifying the SIJS possibility for these children, but then also helping shepherd them through the entire process. They are now Green Card holders and in five years can become citizens. Testimonial # 1: “Prior to getting married, we started researching the Green Card process and immediately I knew it was over our heads and we needed help. I started researching immigration lawyers in our area, and quickly found out how expensive they were. I knew we could not realistically afford a lawyer so I continued looking for a more affordable resource [and] came across Sin Barreras … We knew from the very beginning it was going to take a long time to get the green card, but [Sin Barreras] assured us [they] would be there every step of the way. … August of 2018 we finally received notice of the appointment. Having just found out I was pregnant, I was a nervous wreck and needed to feel assured that we had all the proper documents for the interview…[ Sin Barreras] eased our minds and prepared us for what to expect at the interview. October of 2018, we finally received [my husband’s] green card. It was such a relief to finally be at the end of this journey. I have nothing but positive words to say about … our experience with Sin Barreras. I often tell our story to our friends and not a lot of people realize the time, anguish, and anxiety that come with the immigration process. I, too, did not realize what this process entailed when we started. Having the support and ease of mind from Mr. Wilcher and Sin Barreras made the process of dealing with USCIS more tolerable.” Testimonial # 2: [Translated from Spanish] “For me it has been an unforgettable experience contacting Sin Barreras; because of its personnel and dedication to people who need its assistance, I was able to obtain my goal of becoming an American citizen! It was a stupendous impact. Thank you for your collaboration to the Hispanic people! All of your people are charismatic … It is beautiful work that you do.” IV. Conclusion Sin Barreras has had gratifying success in 2018: increasing nearly all of our directly-served clients in response to the darkening anti-immigrant environment, while indirectly reaching thousands of others to help them appreciate the Hispanic immigrants’ contribution to the US way of life. With the help of important donors, we are now able to remunerate three part-time and, soon, one full-time staff as we become an even more articulate voice of Hispanic issues in Charlottesville and central Virginia. We are enormously grateful to our donors and to the volunteers who make our work possible. As we brace for another difficult year in 2019, we commit to even further dedication to our cause, and a better life for all Charlottesville-area immigrants.